I think I’m going to post a Motorcycle every Monday… Just for my own amusement. A bike that I would love to have or have had or maybe do have? I don’t know yet, but to kick it off… My bike choice of the moment is this. 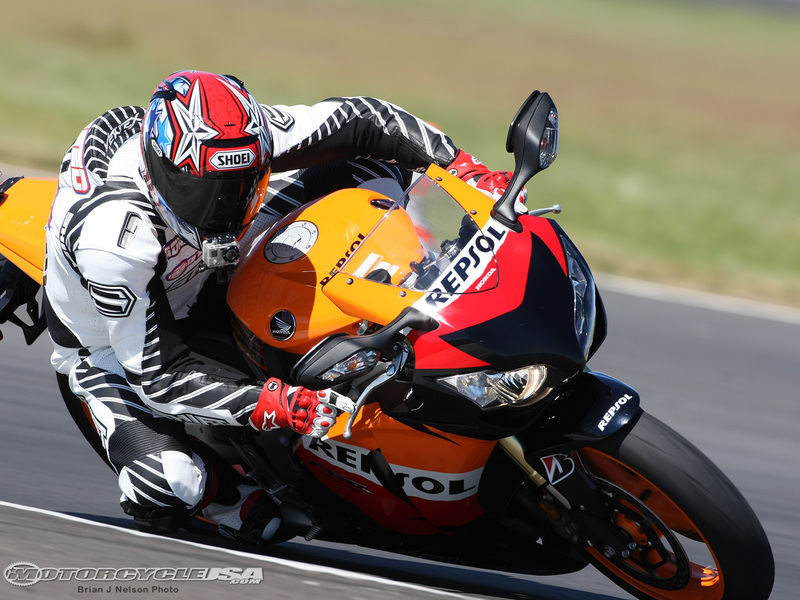 Honda’s CBR1000RR. The Liter Class Leader. It wone the SBK Superbike race in Derby England last weekend. The last few laps were the most exciting ever. On the last turn the bikes were three wide. The Honda’s rear tire slipped. It hit the lead BMW, and sent that bike into his teammate. That took the two lead bikes out of the race. When will that be on YouTube? Gotta see that! Great racing if you watch starting 24:00, the to see the last turn start at 30:00 crash is at 31:01. WOW. “BMW… You are Dismissed.” BAM! Give this a thought…how about readers rides? I just picked up a 1980 Honda CB750F Super Sport. I am seriously considering giving it the cafe treatment. It begs for it. Bike like that… deserves to be Cafe. And just happens to have a past of many Hondas. Lets see: Superhawk, Magna, VFR….. What models am I forgetting? I am a fan of whichever makes the bike with the features and performance that I am looking for, within the price range that I am looking at. As long as it is not a Harley. Sorry, I just cannot stand them. Saber, Interceptor, and a First Gen Magna. I’m not really Anti-Harley. They have a couple bike I wouldn’t mind having. My problem with Harley is the guys that behave as if Harley is the only Motorcycle worth riding. Seriously, it’s that attitude which will insure that I never buy one. I don’t see that attitude changing any time soon. Which is a shame. I quite like that Harley Standard they try to brand as a Sport Bike. As a Standard, It’s pretty cool. Pretty Average, but still pretty cool. Compare that to a Honda Standard – The CB1000R. Yeah…. You can see why I’m a fan of Honda. M – I have not drunk the Harley Koolaid, believe me, but why can’t you stand them? The superiority complex with no justification. I think Victory makes a much better bike. HD bikes are certainly louder, but lack the performance to match it. I am a function before form person. Looks are a nice afterthought for me. Harleys are the opposite. It is all a about looks (which don’t do anything for me anyway). When I was buying my Kawi, I looked at a Harley. My bike is a starter bike. I had a budget of $7200 for the bike “out the door”. My Kawi was just that ( I was looking at the Suk SV as well). I could have had a 36hp, 51#feet of torque 550# Harley 883. It has poorer brakes, no wind protection and much poorer handling than my Kawi. I tried to like the Harley because everyone that I knew that had a bike; had a Harley. American Made and all of that. My Kawi (http://www.totalmotorcycle.com/photos/2006models/2006models-Kawasaki-Z750S.htm )is 103hp, 53#feet of torque and 430#s. And it has wind protection. I bought the bike for a commuting tool. This (with it’s wind protection) was a much better choice. The ONLY problem that I have had with it is that the front plastics broke. I added a Laminar lip for even better wind protection. On a closed course I reached 147(gps) MPH and the fairing broke. That is why the goofy Vetter is on the front. It also keeps me going a little slower (wind resistance). That is my story in a nutshell. The ONLY thing that a Harley has that looks appealing is the belt drive. A comfortable seat would have been nice too. I think I’d be stripping teeth off the belts… That and belts can’t handle much over 100 horses anyways. Thats funny. Is that a Lawn Mower engine? Ogre-San: out here we joke about the “harley face” that some of their riders put on as they pose. But that is a subset, not the whole story..